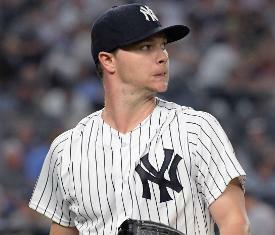 One of the most eminently available starting pitchers on the trade market this offseason is New York Yankees right-hander Sonny Gray, and it appears his next destination could soon become clear. According to reports, the Milwaukee Brewers have emerged as potential candidates to acquire the 29-year-old Gray, who spent the last season-and-a-half in the Bronx after arriving in a trade from Oakland at the 2017 deadline. Yankees general manager Brian Cashman alerted the rest of the league that Gray would be on the trade block heading into this offseason, with the expectation that he could be traded even before the start of MLB's Winter Meetings, set to take place next week in Las Vegas. "When the dust settles, it's not something that works here for whatever reason," Cashman said last month of Gray's lack of success at Yankee Stadium. "There's a population of Major League Baseball teams clearly that recognizes his value; that he will be the guy that he was in Oakland not the guy he was here." Gray went 15-16 with a 4.51 ERA over 41 games (34 starts) with the Yankees, however his career 6.35 ERA in the Bronx was a worrisome statistic for Cashman and the Yankees going forward. The Brewers managed to reach a decisive seventh game of the NLCS before bowing out to the Los Angeles Dodgers this past October, and will be looking to upgrade their shaky rotation heading into next season. Milwaukee rode its formidable bullpen (3.47 ERA, 2nd in NL) deep into the playoffs, but teams can only rely on relief arms for so long before fatigue becomes an issue. Gray has a great chance to turn into a solid low-risk, high-reward gamble for the Brewers if he's able to recapture the form that saw him finish third in Cy Young voting in 2015, when he was an All-Star with the Athletics. While Gray's tenure in pinstripes may not have panned out the way most would have expected, it won't be long before another team comes along to see exactly what he's got left in the tank and it looks as though the Brewers could be that club. Stay tuned for the latest news and developments this Hot Stove season.